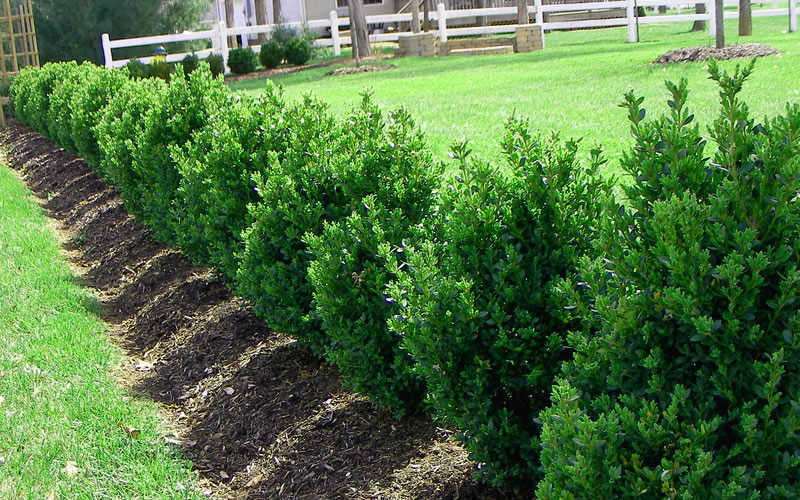 A soft-textured Boxwood that will grow in sun or mostly shade, 'Green Mountain' is a cross between English boxwood and Asian boxwood. It was designed to look great while withstanding both cold temperatures and drought in USDA Zones 5-9. It naturally grows in a dense, pyramidal form with little if any pruning necessary. Get all the details below! 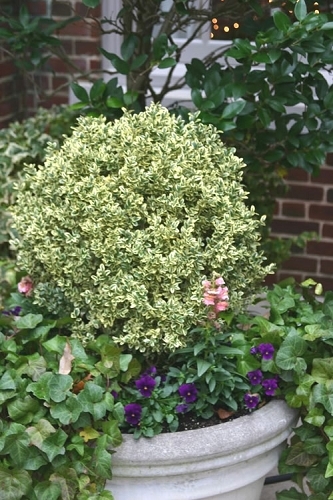 Note: For our customers who live and garden north of USDA Plant Hardiness Zone 5a, where this Boxwood variety is not reliably winter hardy, you'll be happy to know it can be grown in containers that can be brought indoors during winter and placed back outside when temperatures warm up in spring. 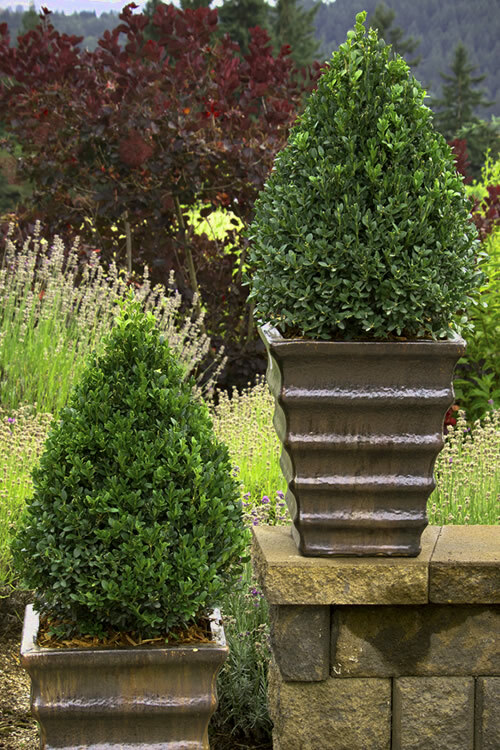 A soft-textured Boxwood that will grow in sun or mostly shade, 'Green Mountain' is a cross between English boxwood and Asian boxwood. It was designed to look great while withstanding both cold temperatures and drought in USDA Zones 5-9. It naturally grows in a dense, pyramidal form with little if any pruning necessary. That said, it responds well to pruning or shearing to an even tighter formal shape. Foliage is a deep grey-green with lighter color new growth in spring. We planted one of these on either side of the entryway to our office, where they receive morning sun with afternoon shade, and couldn't be happier with their look and performance. 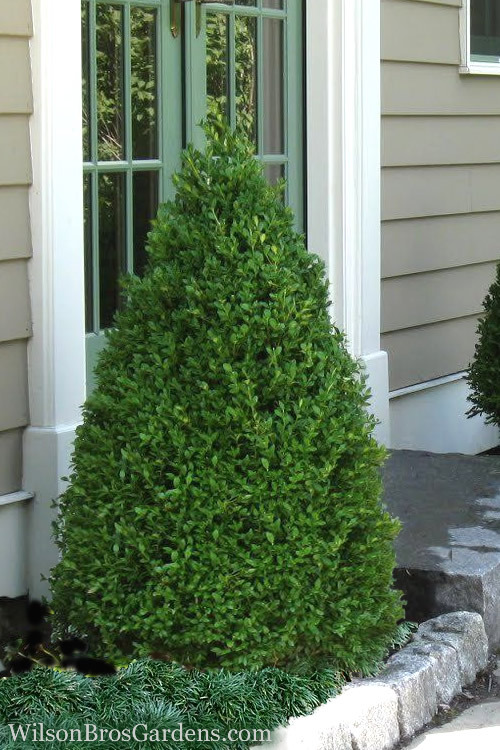 Growing naturally in a pyramidal form to about 4 to 5 feet in height and 3 feet wide at the base, the Green Mountain Boxwood is a perfect choice to accentuate entryways. It is also useful as a distinctive specimen or grouping in landscape borders and home foundation plantings or as a formal clipped hedge. 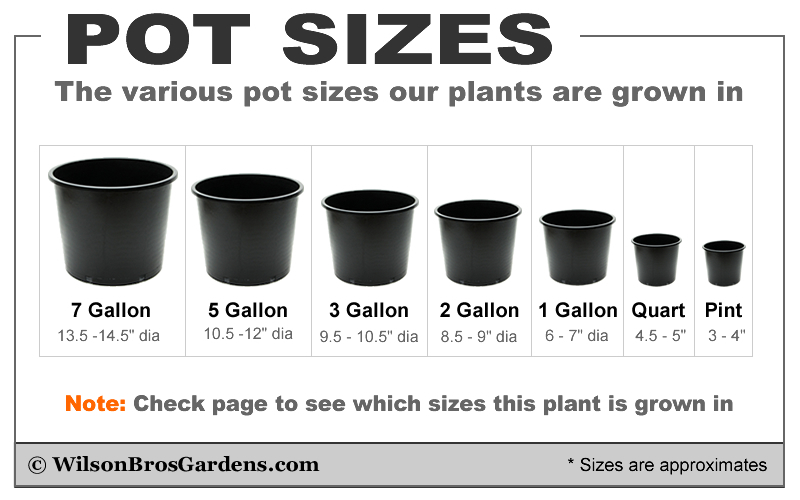 Excellent for pots, planters and other containers. A fine addition to formal gardens, English gardens, and cottage gardens. 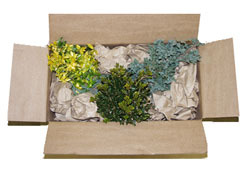 The Green Mountain Boxwood is very easy to grow and requires little if any pruning to keep its natural pyramidal form. It will grow in a wide range of soils but prefers a moist, well-drained loam in full sun to part shade. In our gardens, we have one growing in almost full shade under a large oak tree and it's doing fine, though might not be quite as dense as those growing in part shade or sun. When grown in full sun the foliage takes on a bronze cast in winter. To avoid damage to new growth that can be stimulated by pruning, cease pruning two months prior to the average first-frost date in your area. I recently received my three Green Mountain . All three arrived in great condition and are now planted. I am delighted to have these to complete my landscape design. I have looked in many of the local nurseries and was not able to find them. I am grateful Wilson Bros Gardens had them for purchase. I definitely plan to use the company for other items. 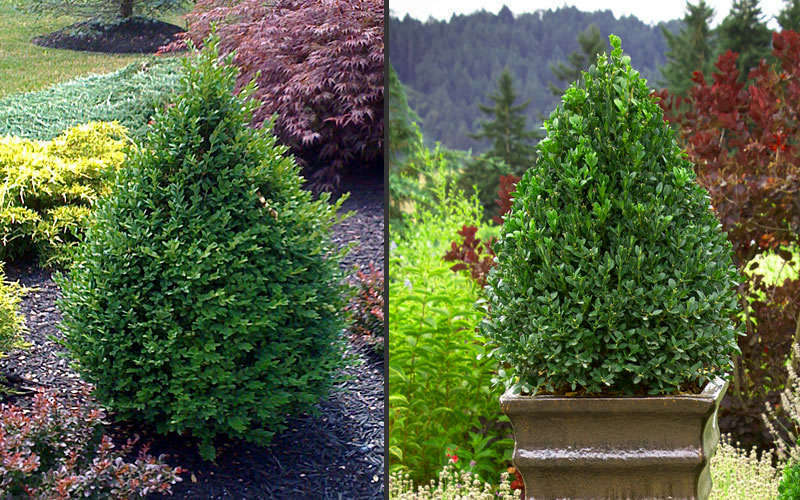 Q: Hi, can I plant Green Mountain Boxwood this month (October 2018) or should I wait until spring? Thank you! 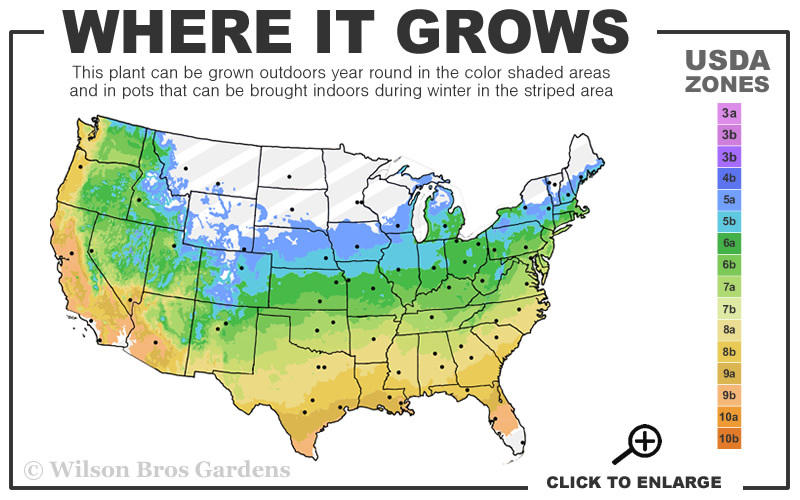 This might depend on the USDA Plant Hardiness Zone you're in. 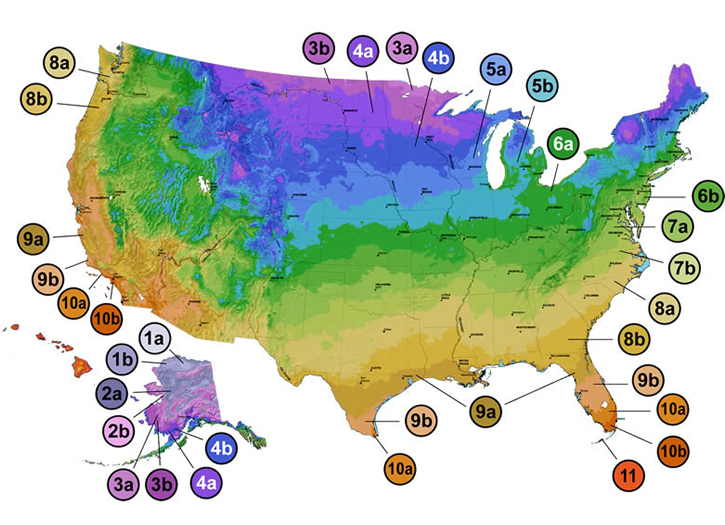 The Green Mountain Boxwood is listed as cold hardy north to USDA Zone 5a. From zones 6a and further south this boxwood should be safe for fall planting. Otherwise, in zone 5 I might suggest waiting until spring to plant. 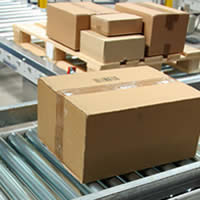 Q: What is the size of the shipped plants and how quickly do they grow? I want two of them for either side of my front door and I don’t have a lot of room. Right now we have the Green Mountain in the JR gallon pots. They are about 12 inches tall and 4-6 inches wide, They are relatively slow growing ( a foot or less per year) and the mature height will be about 5 feet and width about 3 feet. They are also easy to prune if you need them a little smaller when they mature. 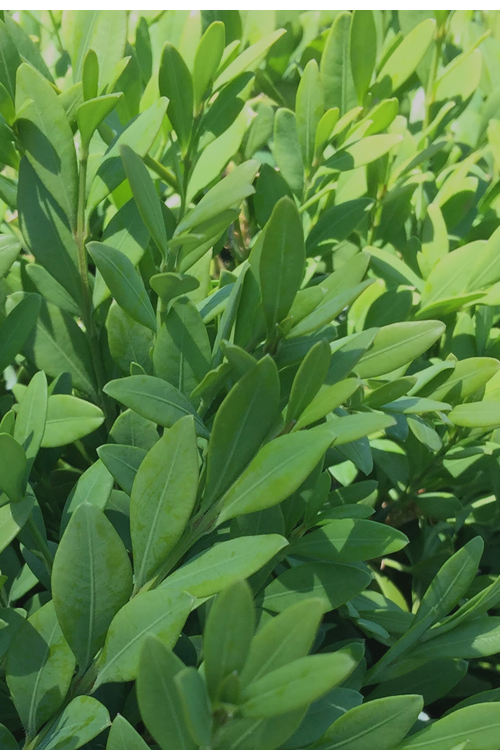 Q: Can the Green Mountain Boxwood grow in afternoon sun zone 8b east Texas? The only personal experience I've had with growing the Green Mountain Boxwood is here in north-central Georgia, USDA Zone 8a. We have some very hot and humid summers and this boxwood does okay here in full sun. That said, when grown in full sun, plant foliage is more likely to scorch and turn bronze in winter. I've heard that the summer sun is very intense there in Zone 8b of Texas. Therefore, I might suggest a planting site that gets some shade or filtered sun during the hottest part of summer afternoons. 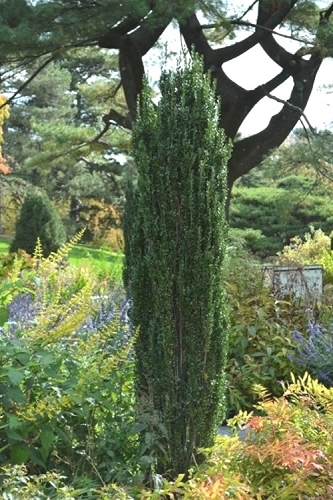 I think if I were going to try a boxwood there in full sun it might be the Japanese Boxwood (Buxus microphylla var. 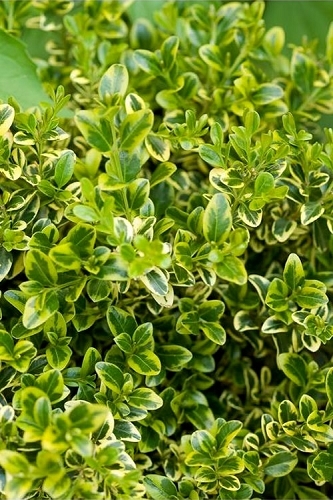 japonica) or 'Wintergreen' Boxwood (Buxus sinica var. insularis). 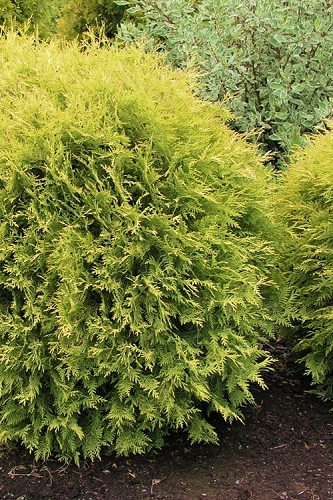 Reason being, these don't seem as susceptible to winter bronzing as are common boxwoods (Buxus sempervirens).